A Norwegian court has charged the alleged leader of an Iraqi-based militant Islamic group with planning terrorist acts. The man, Mullah Krekar, and his organisation Ansar al-Islam, are suspected to have links to both al-Qaeda and Saddam Hussein - something Mullah Krekar himself denies. In a dramatic police operation, Mullah Krekar was arrested at his Oslo home and taken into custody late on Thursday. He had already been charged with violating his refugee status here by returning to northern Iraq as the leader of the militant Islamic group, Ansar al-Islam, on several occasions. Now he has also been charged with planning terrorists acts while living in Norway. This new charge comes after Mullah Krekar earlier this week told Dutch television that Ansar al-Islam could participate in a holy war and launch suicide attacks against American forces in Iraq. Washington has been keen to link the organisation to both al-Qaeda and Saddam Hussein. The US Secretary of State, Colin Powell, has said Ansar al-Islam has given safe haven to al-Qaeda members as well as senior agents of Saddam Hussein's regime in Baghdad. 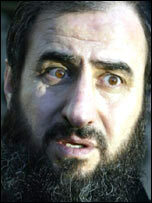 Mullah Krekar has denied any links with either al-Qaeda or Baghdad.